DC Power Co. is the second equity crowdfunding offer completed by OnMarket within the first 3 months of equity crowdfunding launching in Australia. Revvies, a caffeine energy strip producer, successfully completed Australia’s first ever equity crowdfunding offer, raising over $250,000 in March 2018. Amassing the largest crowd to participate in an equity crowdfunding raise, is what we at OnMarket believe to be the true essence of equity crowdfunding, that is, to bring together the community to invest in companies making a difference. OnMarket’s Managing Director and lead on the offer, Rosie Kennedy, commented that “Australia’s $15bn retail electricity market is undergoing significant change with the increasing popularity and accessibility of renewable sources. We have been excited to bring this equity crowdfunding opportunity to all Australians”. 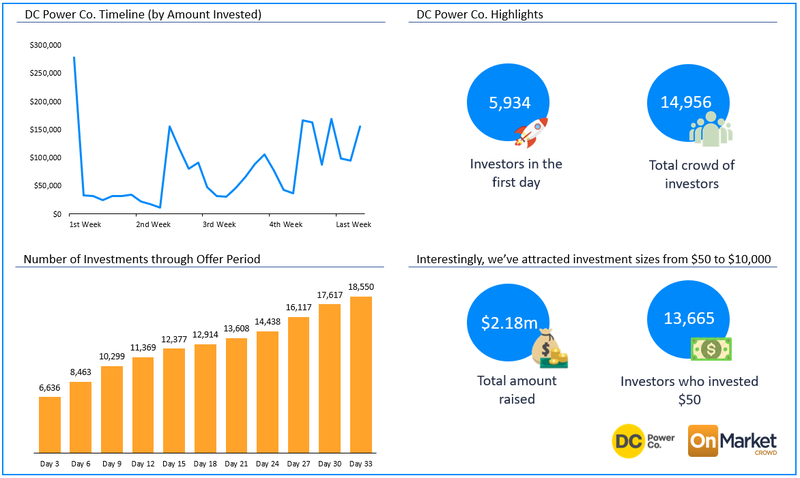 The initial maximum bid for retail investors into the DC Power Co. offer was only $50, but due to overwhelming investor interest, the maximum was increased to $10,000. Having crowdfunded close to $2.2m, DC Power Co. aims to give solar people cheaper bills, better feed-in tariffs, transparency around how solar investment works, and genuine guidance to get more out of solar and wholesale top-up prices. The company was founded six months ago by social entrepreneur Nic Frances Gilley, Flexicar founder Monique Conheader, investment banker Emma Jenkin and solar expert Nick Brass. DC Power Co. are hoping to tap into the almost 2 million solar households in Australia and a potential 6 million by 2050. DC Power Co. co-founder Nic Frances Gilley believes that renewable energy is the way of the future, both as a business model and as an environmentally responsive solution to current outdated energy business models. He truly believes in equity crowdfunding as a new way for businesses to raise capital, commenting that “The beauty of accessing the crowd is that our new investors will become our endorsers, our influencers and our advocates”.